“Marc Estrin” discovers that another writer’s novel — The Nose — not only has spawned a bizarre cult among the nation’s youth, but is based on the extraordinary life of a real person—an outcast named Alexei Pigov. “Estrin” searches Alexei out and asks him to provide annotations to The Nose. Alexei says that—although the events of the novel might, for the most part, be real—the purported reasons for them are all damnable lies. On the left-hand page of The Annotated Nose we read The Nose itself, and take in its beautifully unsettling illustrations. On the right-hand page we follow Alexei’s complaints – always surprising and often far-reaching. The layers in Estrin’s remarkable comic book are as multiple, eclectic, and outrageous as the sequence of masks Alexei wears to hide his face from the world over the caroming trajectory of his most unlikely life. 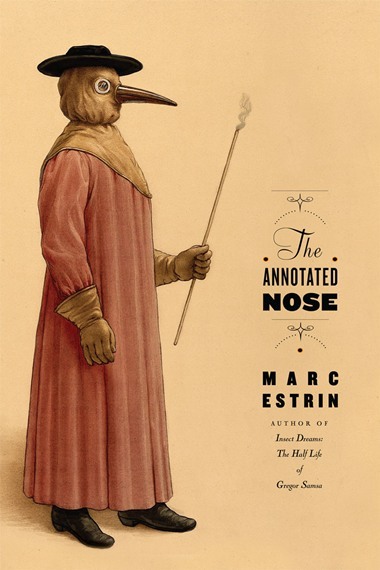 The Annotated Nose is at once Marc Estrin’s most playful and his most ambitious work to date. A signed and numbered limited edition of 75 copies is also available. There are many people, but there are many more faces, because each person has several. Some people wear the same face for years, and naturally it wears out; it gets dirty; it splits at the folds; it stretches, like gloves one has worn on a journey. These are thrifty, simple folk; they do not change their faces; they never even have it cleaned. Their face is good enough, they maintain, and who can say otherwise? . . . There are people who change their faces uncannily quickly,one after another,and clear them away. At first they think they have enough to last them forever; but they are scarcely forty when they have come to the last of them. This naturally leads to tragedy. They are not accustomed to conserving faces. Their last is worn through in a week, has holes in it, and in many places is paper-thin; and then gradually the lining—the no-face comes through, and they go around with that. Marc Estrin is a writer, cellist, and activist living in Burlington, Vermont. He is the author of seven novels, The Annotated Nose, Insect Dreams: The Half Life of Gregor Samsa, The Education of Arnold Hitler, Golem Song, The Lamentations of Julius Marantz and most recently The Good Doctor Gullotin. Author photo by Donna Bister.